In April, we moved into a new neighborhood. We are in the tail end of homes in this neighborhood, so some people have already been here 2 or 3 years, but there are still homes being built. Up until this past weekend, we've been the newest neighbors. 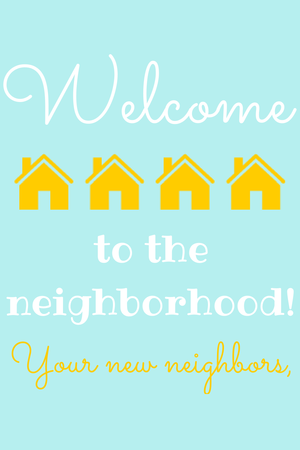 Right next door, a town home was just completed, so we'll have TWO sets of new neighbors! One moved in, so I wanted to take a little welcome gift. It kind of makes me sad that people aren't as "neighborly" as they used to be, so we have been purposing to really get to know our neighbors. It just makes living in a neighborhood so much better, doesn't it?! Knowing you have people you can borrow a cup of sugar from, or who will keep an eye on your house and let you know if something is off. I love the community aspect! Back to the point. We had met our new neighbor once when she came by to do the final walk through so we knew she was moving in with her two kids. I want to make her dinner, because I know how stressful moving is, let alone moving with two young kids! I love adding little touches to things, so I made up this printable to stick on the casserole. Right click to save photo. Personal use only, please! I thought this would be cute to add to a casserole, or even just a plate of cookies. I'm sure if you search Pinterest you could find all kinds of cute new neighbor gifts. I left the bottom blank so you can write in your own names, or even throw your house number on there if you are just dropping something on the porch. 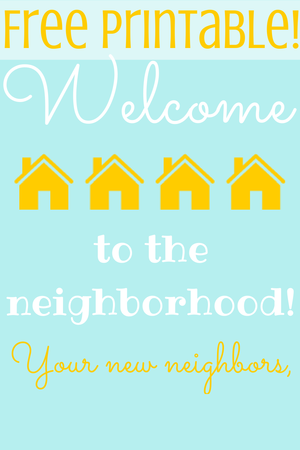 I think everyone would love to be welcomed by the neighbors when they are moving into a new home! Enjoy! Thank you for this printable pic. I'll also use your idea and search for new neighbor gifts on Pinterest. Thank you, I'm happy that I'm not the only one who thinks that it's important to be in good relationship with the neighbors.